With yield maps farmers know the yield and moisture of their crops – total for the field, average, and for each point. Thus, they can evaluate the potential of their fields and crop varieties. Ag Leader yield sensors are patented and are the most accurate in the industry (1-3%). Most combines can be retrofitted with such sensors. Some John Deere combines are factory equipped with such sensors under an OEM agreement with Ag Leader. 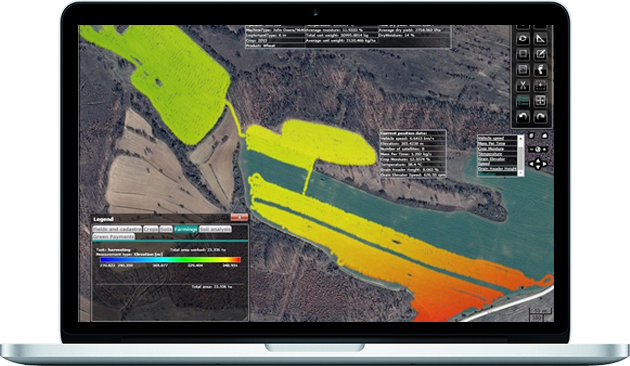 Using NDVI (Normalised Difference Vegetation Index) data, farmers can differentiate the strong from the weak crop zones. Based on that, they can apply the optimal amount of nitrogen for each zone. Farmers can capture NDVI data several times during the growing season with every pass through the field (e.g. not only with the spreader, but also during spraying). This way they can gather real-time information about their plant development. 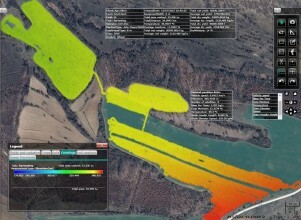 By overlaying several NDVI maps, farmers can adjust their fertilization strategy on-the-go. This is called a dynamic fertilization plan. It is a very efficient approach, because nitrogen is applied depending on the crop needs at the moment, and not on soil analyses, made months ago. Soil nitrogen content can be very dynamic, especially in sandy soils and with high precipitation. That is why, it is very important to apply the needed amount of nitrogen in the right time. Some farmers try to insure themselves by applying more nitrogen, “just in case”. This can also be potentially problematic, because it can cause plant lodging. 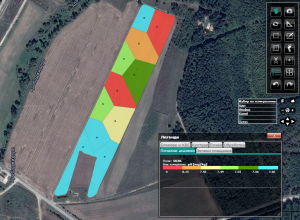 Application maps display the prescribed and the actually applied quantity of inputs – plant protection, fertilizer, lime, etc. These maps are useful source of information when analyzing the probable causes of certain crop conditions. Application maps also show the quality of work, e.g. if there are any gaps or overlapping (especially on manually steered machines), if the equipment is operating properly, etc. 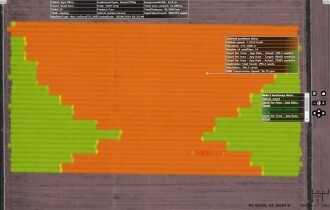 The display below shows spraying after germination of corn. On the left hand side it can easily be seen, that the application rate is quite uniform (in blue colour), except in certain points where it increased drastically – from 100 to 330 litres/ha. When we overlay the vehicle speed map (on the right hand side), we can see that in these points there is a sudden drop in the speed – from 25 to 4 km/h. This may later cause low yield in this point. Also, it is an indication to inspect the sprayer mechanisms. Seeding maps display the crop varieties planted in each field. Farmers can specify variable rates (seeding density), depending on field specifics and target yield. If a farmer decides to use a high yield strategy, most often a high seeding rate is required. With high plant density, however higher rates of fungicide may be required as well. The reason is that higher air humidity between plants is a favourable prerequisite for disease development. And, of course, plant nutrition rates should also be adjusted. Seeding maps are also very convenient for making multi-year crop rotation plans. Prescription maps for Variable Rate Application (VRA) allow farmers to apply a different amount of input for each field zone. The goal of VRA is to otpimise the result. One strategy would be to apply more inputs only to areas with potential to give higher yields. An alternative strategy is to apply more to weaker areas in order to have a more homogenous yield across the field. Homogenous yield can increase the harvesting efficiency of combines by making the grain flow in the threshing mechanism more constant. 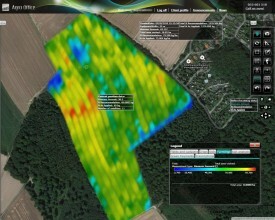 The right application rate for each zone can be determined by an agronomist based on information from other maps – e.g. soil type and nutrient contents, seed density, previous year yield maps, amount of precipitation, etc. Agro Office ® can be used for planning and guiding soil sampling, recording soil analysis results and displaying soil maps. For the purposes of soil sampling planning, soil sampling field zones can be defined. For each field zone there can be several soil sampling locations (as points on the map). These locations can then be exported to a GPS device. With the GPS device, the soil sampling team can easily find the soil sample locations in the field. After the soil samples have been analysed, laboratory results can be imported in the software. 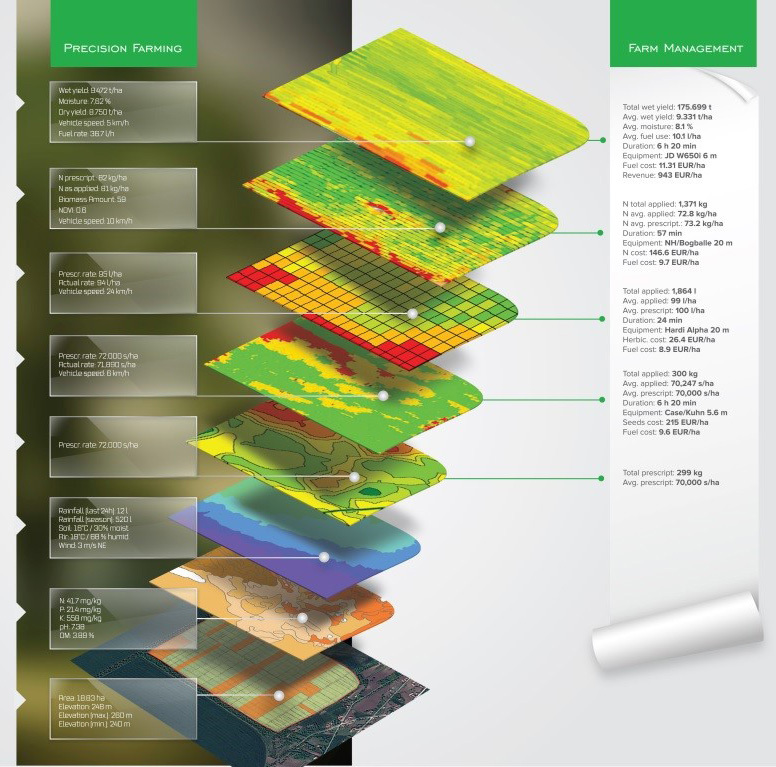 Agro Office ® automatically generates a colourful soil map for each type of nutrient (e.g. nitrogen, phosphorous, potassium, pH, organic substance (hummus), sulphur, zinc, etc.) Colours depend on the content of the respective nutrient. Soil maps can be displayed in layers, one over the other. Ca, Mg, S, Zn, B, Cl, Cu, Mn, Fe, etc. Apart from soil nutrients, you can also display your soil type and texture maps. Soil type is a characteristic, which is usually constant in time. It is a very important factor, since it determines parameters such as water holding capacity, soil nutrients utilisation, etc. Soil texture – sandy, clay, silt, loamy, etc. Agro Office ® supports three types of pictures – Google Maps, Microsoft Bing maps, or custom orthophoto imagery, so that users can have the most recent bird’s eye view on their fields. Another characteristic, which influences soil moisture and nutrient contents, is elevation. Agro Office ® displays topographic maps based on altitude data from GPS receivers.